Style, sophistication and originality. That's what you'll get when you choose to use these return address labels depicting an eye-catching letter 'S' monogram. Every letter or package you send in the mail will exude excellence and elegance. But what you'll really love about your new labels is how they make your everyday life a little bit easier. Forget that tedious task of scribbling out your name and address on each envelope. Now you can just peel and place thanks to the self-adhesive backing. 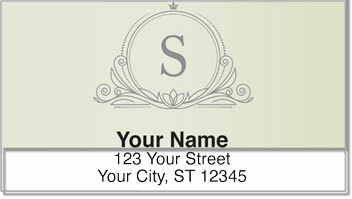 Make our S Monogram Address Labels yours today! You can even complete your order with matching monogram checks.